Tom's Realestate site is completely database driven. This allow Tom to update her searchable home listings, without doing any HTML coding (including multiple images per listing). The site also has an updatable newsletter and and updatable bar graph that shows sale prices for different home styles in three different communities. The graphics on the site have the same look and feel as her advertising in other media, so that she presents a consistent look and feel in all her advertising and promotion. Again, and easy to use web interface to upload text and images to an on-line database. The Careze.com site does not have a lot of bells and whistles, but was done on an extremely tight budget and in a very short period of time. The next step is to build an interface so that interested people can sign up to receive an e-mail every time a car that meets their criteria is added to the site. The Birthrite Education site is used primarily for the promotion of their education services. A lending library for Pregenancy, Birth and Post Partum related books has been recently added to the site. A database driven mailing list is the next feature to be added to this site once sufficient demand is in place. 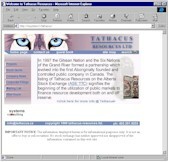 Tannis's Realestate site is completely database driven. This allow Tannis to update her searchable home listings, without doing any HTML coding (including multiple images per listing). 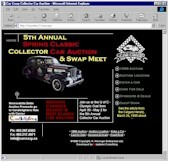 Website development for the promotion of the Annual Spring Classic Collector Car Auction & Swap Meet in Calgary Alberta. The auction typically has 200 to 300 cars during the auction. Website development for Marketing Department, and Corporate Relations. Investor updates are put on the site by an administrative assistant thought a web based interface (no html required). News releases are e-mailed to anyone who signs up via the "News Release Update" form. Up to date information is posted to the site on projects being developed, or under consideration. Website development for Public Relations Department and Funeral Service Education Program. 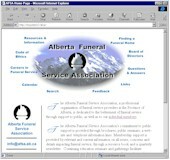 Funeral Home finder map to easily locate funeral homes in any area of the Province.